WorldCupAdvisor.com provides an elegant trading solution for many investors. We identify talented professional futures and forex traders and enable subscribers to automatically mirror their live trading. Trade leaders have their own money on the line, right along with their followers. We provide a variety of analysis tools so that you can find a program to follow that's right for your needs. Our LF TradeSync platform™ was designed to deliver same-price fills to leaders and followers alike. All trades displayed on WorldCupAdvisor.com are actual trades in funded accounts. No hypothetical results are used. Details of every round-turn trade made in every available account are shown in each program’s Trade History section. Profit/loss in the Trade History section is shown exclusive of commissions, fees, transaction and subscription costs; to evaluate the impact of these trading overhead costs, click the Net-Profit Calculator link. Read about each advisor and account specifications in the +MORE INFO sections. Subscribers sign a Letter of Direction with WCA-authorized brokers, who follow the signals on their behalf automatically with World Cup AutoTrade™ service. Subscriptions are available only to AutoTrade clients to ensure that a contract-size maximum is not exceeded. Subscriptions are sold on a month-to-month basis, eliminating long-term commitments. With AutoTrade service, subscribers can start a new program or stop an existing one with a single phone call. The wide variety of WCA accounts gives investors the opportunity to diversify across asset classes, trading products and strategies. Please note, however, that diversification in not necessarily available when trading a single program. Potential subscribers should evaluate each specific program's specifications to determine whether or not that program is suitable to the individual based on that person's diversification requirements. Monthly subscriptions are sold separately for each program. We try hard to identify traders we believe are capable of sustaining profitable performance on a net basis over time. Many of our advisors have posted top finishes in the prestigious World Cup Trading Championships®. We also feature accounts traded by noted system developers, authors, commentators and educators. The WCA live trading "incubator" is an active testing ground for new programs. Advisors compete with each other to earn customer subscription business. It is important to remind you that trading futures and forex involves significant risk of loss and is not suitable for everyone. Following any of our lead accounts should be undertaken with risk capital only. Before investing, you should carefully consider your risk tolerance and suitability for this type of investment. 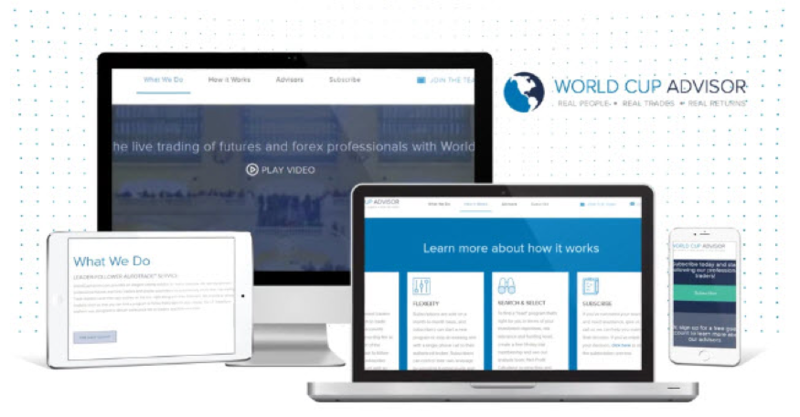 Our two-minute video illustrates how subscribers can automatically mirror the trading of experienced futures and forex professionals, including winners of the World Cup Trading Championships®. In WorldCupAdvisor follow-the-leader programs, if your fill price is not equal to or better than the advisor's fill price, the trade is commission free from your authorized AutoTrade broker. White label a WCA Gallery page for IB’s. Do you currently have talented self-directed traders on your books? If the answer is yes, we have an excellent way for you and your client(s) to benefit. The returns for trading systems listed throughout this website are hypothetical in that they represent returns in a model account. The model account rises or falls by the average single contract profit and loss achieved by clients trading actual money pursuant to the listed system's trading signals on the appropriate dates (client fills), or if no actual client profit or loss available - by the hypothetical single contract profit and loss of trades generated by the system's trading signals on that day in real time (real-time) less slippage, or if no real time profit or loss available - by the hypothetical single contract profit and loss of trades generated by running the system logic backwards on backadjusted data (backadjusted). The actual percentage gains/losses experienced by investors will vary depending on many factors, including, but not limited to: starting account balances, market behavior, the duration and extent of investor's participation (whether or not all signals are taken) in the specified system and money management techniques. Because of this, actual percentage gains/losses experienced by investors may be materially different than the percentage gains/losses as presented on this website. The information contained in the reports within this site is provided with the objective of "standardizing" trading systems account performance and is intended for informational purposes only. It should not be viewed as a solicitation for the referenced system or vendor. While the information and statistics within this website are believed to be complete and accurate, we cannot guarantee their completeness or accuracy. As past performance does not guarantee future results, these results may have no bearing on, and may not be indicative of, any individual returns realized through participation in this or any other investment.